Rosie has been with Latin Lawyer since 2006. She has built up a deep knowledge of the Latin American legal market over the years and enjoys the regular opportunities to visit the region. As well as editing Latin Lawyer and the Latin Lawyer 250, Rosie is interested in law firm strategy and oversees content in that area, including Latin Lawyer’s regular surveys. Rosie studied Business Management and French at Leeds University and went on to obtain an NCTJ Diploma in Journalism after a brief stint in financial public relations. 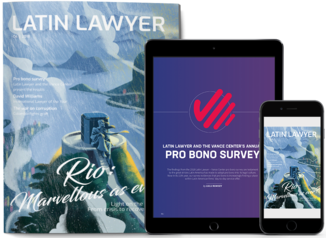 When she first joined Law Business Research she wrote across all of its publications, but quickly realised her interests lay in Latin America and has remained at Latin Lawyer ever since. Lulu has written for Latin Lawyer since 2013, when she joined as a trainee reporter. Now news editor, she enjoys writing about developments in the region, with a particular focus on Argentina and Chile. She has a BA in international history from the London School of Economics and a postgraduate diploma in journalism from News Associates. Before joining Latin Lawyer, she worked for a lifestyle magazine. Tom joined Latin Lawyer in early 2014. He previously worked for several US and UK-based risk analysis consultancies and held a teaching post at the Instituto Chileno-Británico de Cultura in Santiago, Chile. Tom holds an MSc in Global Governance and Ethics from University College London and a BA in Latin American Studies from the University of Liverpool. He speaks Spanish fluently, having studied and worked in Chile and Mexico for nearly three years. 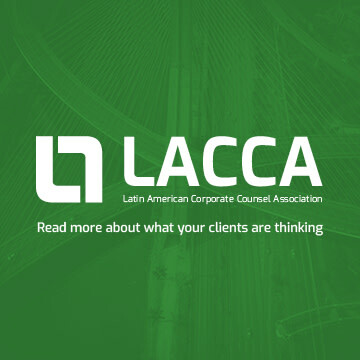 Alison is the editor for the Latin American Corporate Counsel Association (LACCA). She joined LBR in 2013 as a reporter after completing an MSc in Latin American Studies at Oxford University, where she won the Crawley Prize for best thesis. Prior to this, she gained First Class Degree in Portuguese & Brazilian Studies from King’s College London. Ali holds a keen interest in Latin America and has spent time living and working in the region. Gwyneth joined LACCA in 2016 and is a fluent Spanish speaker. Her interests in Latin America stem from studying literature from the region during her undergraduate degree in French and Spanish, and were solidified during a year abroad she spent in Mexico, working for an independent family lawyer. Upon return to England, Gwyneth studied for a master’s degree in international relations and devoted her thesis to analysing the military dictatorships of Guatemala and Chile. Clare Bolton is the publisher of Latin Lawyer and LACCA, and as such brings together the commercial and editorial strategies for both publications. She started at Latin Lawyer in 2005 as a news reporter, later becoming editor of the publication for a number of years. She moved to São Paulo in 2010, and spent five years covering the rapid development of legal markets in the region from there. Her time at the helm of Latin Lawyer has seen the launch of a daily news service, a successful and growing events arm, our sister publication LACCA, and a focused development of content covering strategy and management issues in the legal profession. Before joining Latin Lawyer, she worked for local government in London, and received her degree in English Literature from University College London. She now lives in London with her Brazilian husband, daughter and street dog.